19.03.19 - St Michael and All Angels church, Trelawnyd will be open to pilgrim visitors on Saturdays, Sundays and Mondays during April and also Good Friday. Refreshments will be provided in the church porch. We hope you will visit our beautiful church! The dates are 6,7,8,13,14,15,19,20,21,22,27,28,29 April. 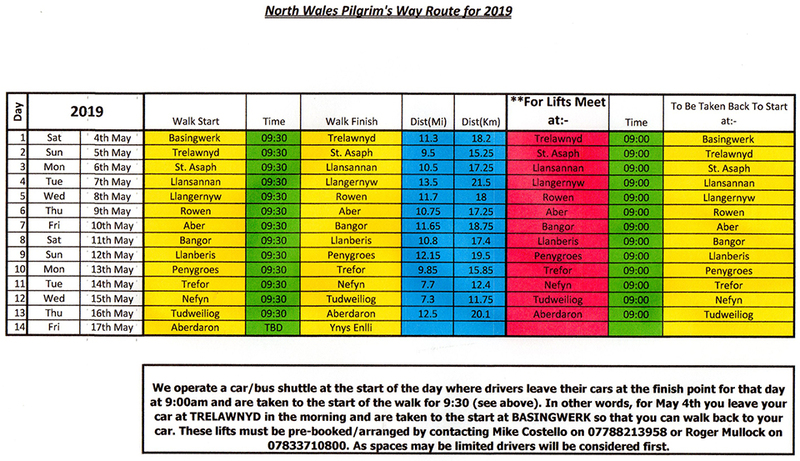 25.02.19 - The footpath at Tremeirchion is subject to excessive mud and the following diversion is suggested (see Map). From the Church at (1), walk downhill and turn right at the junction. At the next junction (2), take the road on the left signposted Trefnant. (Take care on this road as it potentially quite busy). This is a long straight road going downhill. Follow until you arrive at the entrance to Hafod y Coed on your left hand side. Here take the footpath on the OPPOSITE side of the road (3). This Green Lane takes you a field where you turn left (4) to rejoin the Pilgrim's Way following a hedge on your left to eventually join a farm access road. Turn left and follow this road until you reach the village of Waen. 19.11.18 - Andrew McClymont who has completed the Pilgrims Way this year, albeit with 'slight variations' and 'not all in one go' has been good enough to share his experiences with us through his colourful diary, which can be found on our Inspiration Page. 02.10.18 - The route between Holywell and Pantasaph has been obstructed by a crop of turnips. This is at Penyball Trig Point. The best way around this is by turning right, as you come up the hill, and walking around the field. 07.07.16 - Greenfield Valley Visitor Centre is now open after refurbishment and the passport stamp will be available as well as one at the Holywell Shrine centre. 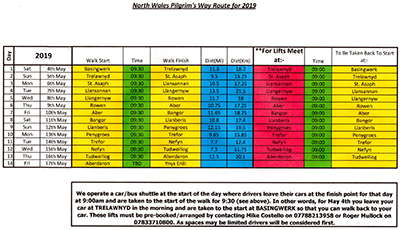 29.06.16 - There is now a folder in St Hywyn’s Church, Aberdaron, for pilgrims to record their journey along the North Wales Pilgrim’s Way. You will find the book on the pilgrim table which is beyond the bookstall on the left. We would be so grateful if you could please sign it – Thank you. Claire Henderson Davis is a theologian/dancer/choreographer whose “Passion” was performed at Ely Cathedral and the Edinburgh Festival. She is currently artist in residence at Chester Cathedral and will be working with young people on the concept of pilgrimage over the next couple of years, culminating with walking the North Wales Pilgrim’s way. 13.10.15 - Pilgrims Way Sign has been renewed at The Greenfield Visitor Centre site (Basingwerk) making things a lot clearer. 14.04.15 - The path between Trelogan and Llanasa at the North Clwyd Animal Rescue can be very muddy. This can be avoided by turning left on the drive to the buildings and walking up to the road and turning right to walk down to the village of Llanasa.